Horse tack refers to any equipment put on a horse for the purpose of horseback riding, driving, or other equestrian sports. 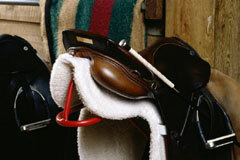 The most common pieces of equipment include saddles, bridles, and driving harnesses. HorseTack.us offers convenient access to selected horse tack suppliers plus other helpful equestrian resources. We hope you enjoy browsing, and come back to visit us often! 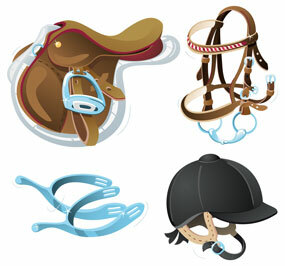 Saddles are designed for either Western or English riding styles. Western saddles are easily identified by the horn on the pommel (front) of the saddle. The horn was developed as an aid for cowboys, enabling them to tie a rope to the saddle horn on one end and a cow or calf to the other end. 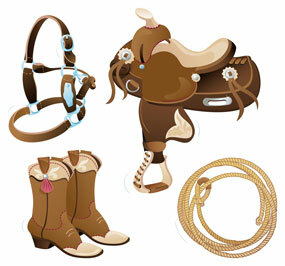 Western saddles are used for western pleasure riding, roping, and other Western disciplines. Australian stock saddles are closely related to Western saddles. English saddles are much smaller and lighter than Western saddles, and they are used for jumping, dressage, racing, and other English riding disciplines. Jumping saddles have forward-cut knee flaps and low pommels, allowing the rider to rise into "two-point" position over a jump. Dressage saddles have straight knee flaps and a deep seat, allowing the rider to have close contact with the horse for performing advanced maneuvers. Racing saddles are extremely light, providing just enough support for a jockey to perch on top of a galloping racehorse. A bridle is headgear that is used to control a horse. It comprises leather straps, with buckles, to which reins and a bit are attached. Bridles may also be categorized as English and Western, but the real difference is in the bit. Snaffle bits apply pressure on the corners of the horse's mouth, while curb bits apply pressure on the poll (between the horse's ears). English riders hold the reins with two hands and use a direct reining technique, while western riders use one hand and neck rein. 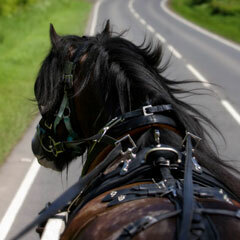 Driving harnesses are used for pulling carts, wagons and carriages. The traces attach the horse to the cart, the collar around the horse's neck allows the horse to pull the cart, and the breeching keeps the cart from hitting the horse's hindquarters. Long reins and a driving whip allow the driver to direct the horse, and blinders lower the chances that the horse will spook. This online tack shop features a broad selection of horse tack and horse supplies for English and Western horseback riding. Featured listing. This equestrian website features an extensive directory of horse tack shops as well as sources for all types of horse products, stable supplies, and horse gifts. This Massachusetts-based equestrian supplier offers quality riding apparel and tack products for horses and their riders. This discount horse supplies catalog lists English, Western, and Aussie saddles as well as tack and gift items. Kansas-based firm features a wide range of equine products, horse health items, stable equipment and horse supplies. This Ohio-based Western shop features Western apparel, tack and unique western gifts. Shop Rod's for brand name cowboy and horse gear including hats and boots, western wear and jeans, saddles, riding equipment, show clothing and more. Horse Directory - equestrian information resources. 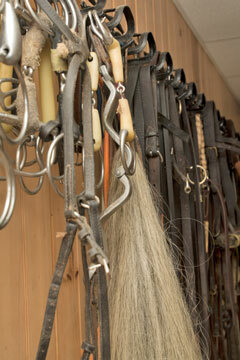 Tack Shops - local equestrian equipment suppliers. Horse Videos - several videos about horses.